ikat bag: Personalized? I'll Give You Personalized. Since we're on the topic of zippered containers, I thought I'd share what I just made. Plans are underway for our annual pilgrimage to the Equator to visit family. The children are excited, and have made wish lists and grand plans to visit the art supply stores in Singapore to stock up on art supplies. Ironically (and somewhat ridiculously), they also mean to pack all their USA-bought art supplies on the airplane, so as not to get bored on the 20+ hour flight. I will veto most of it, but I love that they are now old enough to plan and pack their own airplane entertainment! Not surprisingly, there have been requests from the kids for more containers for their various odds and ends. 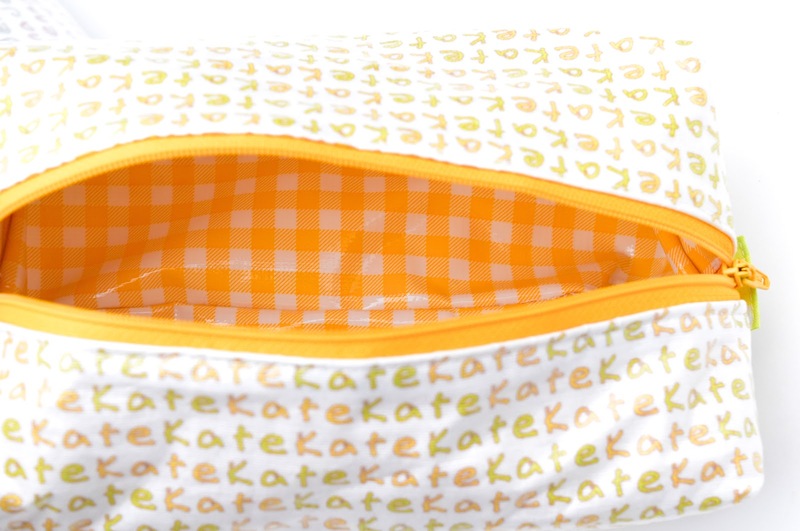 Kate, for instance, has ordered another marker pouch. Then, everyone got new fold-up headphones so we don't have to endure the torture that is standard-issue airline earbuds, and I've had to sew drawstring bags for those. Also, each of our screens - laptop, iPad, tablet, iPod, etc. needs a traveling case for cushioning within backpacks. And everyone has hinted that they need larger stationery holders. 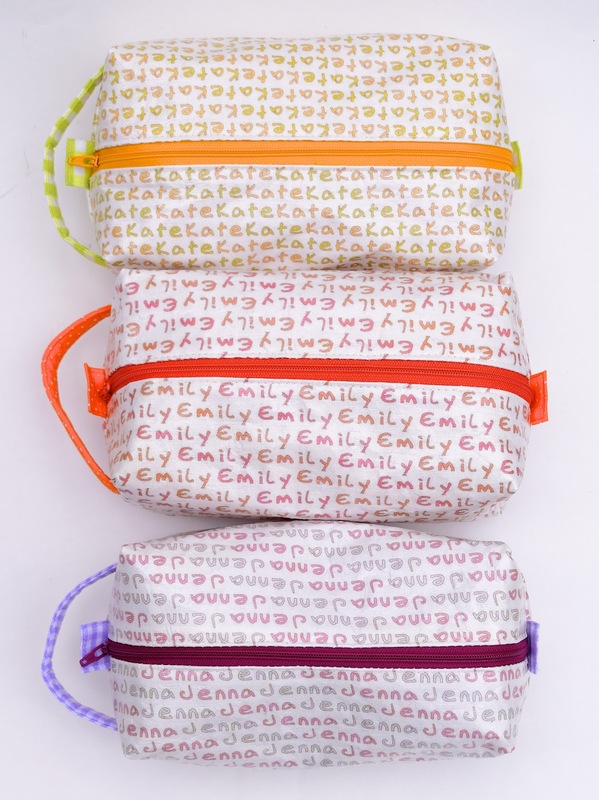 More zippered pouches, in other words. So I dug around in my stash for suitable fabric. 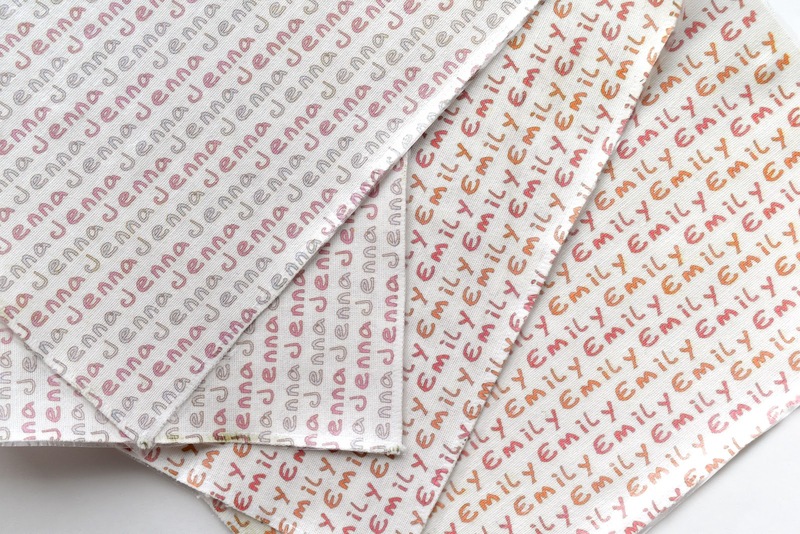 panels of natural twill, printed with the girls' names on. Which I'd been saving for the perfect project for when the kids were older. 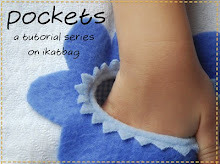 Like zippered pouches! But first, a lamination treatment, to turn them into wipe-clean fabric. Which had the added advantage of stiffening the panels so I didn't need any interfacing - just the outer and the lining layers. They are made exactly the same way as the boxy darted pouches here, except I added a carrying strap across one end. I remember now why oilcloth isn't very fun to work with as a lining - among other things, you can't hand-stitch an opening in an oilcloth seam - it's just icky. I had to open a seam in the main outer fabric instead, for turning everything right side out. Not the end of the world, except ladder-stitching laminated twill isn't that much more thrilling than oilcloth, either. But! I told myself, the trade-off is No Bulk because there was no need for headliner or flex-foam or batting or whatever! Thanks for the scrumptious fabric, Jen! I finally used it, albeit 5 years late. See you soon! 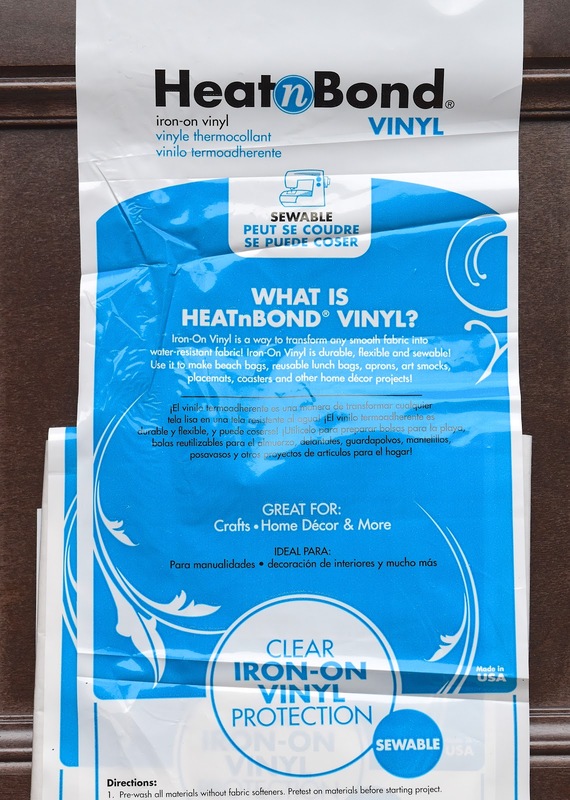 I recently bought and used that iron-on vinyl, and was disappointed at how different the finished result is from 'real' laminated cotton (not oilcloth), which has a lovely hand. My fabric is stiff and --ugh-- crinkly sounding! How do you find it? Hashi - I've had this iron-on vinyl for years now, and never had a reason to use it. I've been skeptical, because as a habit, I don't doctor my fabrics - i.e. I don't even use fusible stabilizer if I can help it. I do not like stiff plasticky fabrics in general - oilcloth, real laminated cotton etc, because they do not handle well. 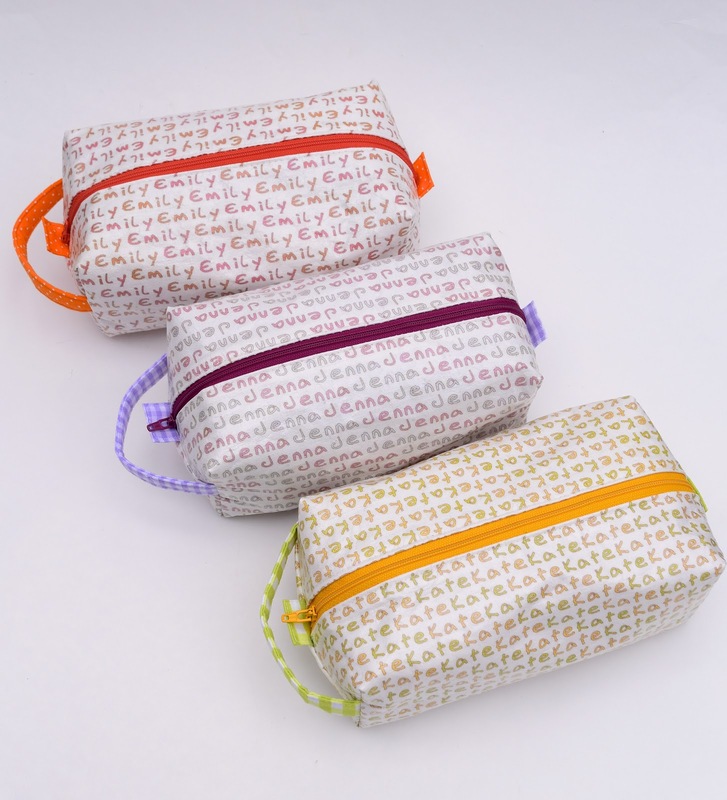 I'd much rather use woven nylon packcloth, which is not sticky, and sews wonderfully, and looks much more professional than oilcloth or any laminated fabric. That said, I didn't mind doctoring this particular fabric, because anything would be an improvement over a light-colored, somewhat precious thing like this personalized print that is bound to get dirty and stained with use (and accidentally-leaked marker ink). I am happy with the outcome, largely because I didn't expect it to come anywhere close to nylon packcloth in feel, and was fully imagining it to be crinkly and crushy. It feels like kevlar (? ), that material that the US priority mail envelopes are made of. And I also fully expected it to crush while being turned RS out through the opening in the seam. So no surprises there, and nothing a quick press under a warm iron didn't fix. So summary: not as smooth as oilcloth or laminated cotton, and I'd never use it for anything other than a small pouch or case and, like all its plasticky cousins, does not perform well being turned inside out and wrong-side-right through smallish openings. But it does work satisfactorily, if one remembers that this is plastic, not real fabric, and turns even real fabric into plastic. I used HEATnBOND on a pouch for Miss C several years ago. It's held up very well, although is starting to crack a bit now, but it's gotten lots of use! I did use HEATnBOND once. I wasn't too smart and washed it. It came right off the fabric :) I think wipe-clean is key! Love the little pouches! Alana, thank you for the tip! 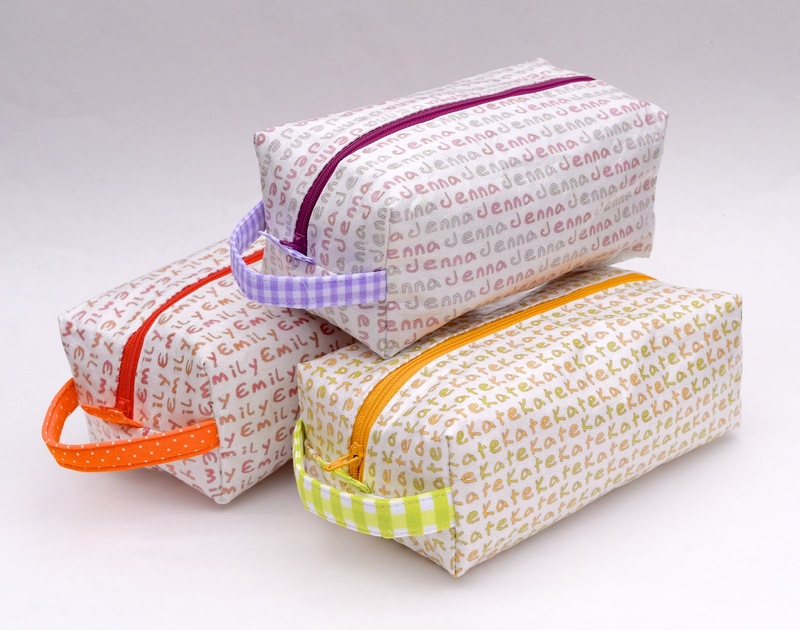 I do not plan to wash these pencil cases, but mainly because of the oilcloth lining, rather than the laminated outer. Never thought about how the laminated fabric would stand up in the washer because in some corner of my mind, laminated fabric = plastic/cardboard/not cloth, and I wouldn't dream of wet-cleaning it. That is a really cute way to personalize! Cute! I've used self laminated fabric for wallets and it worked quite well. After 2-3 years of constant use, the edges began to crack but I think that's a pretty good return on the money and effort. 8-) Where, oh where did your friend get the fabric? I love it and would really like to do something similar for my granddaughters. Kris C: She printed them herself. 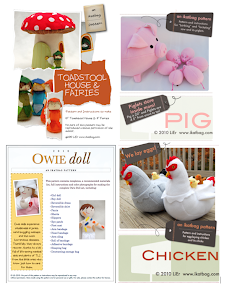 spoonflower.com is one example of a company that custom prints fabric. Terrific! 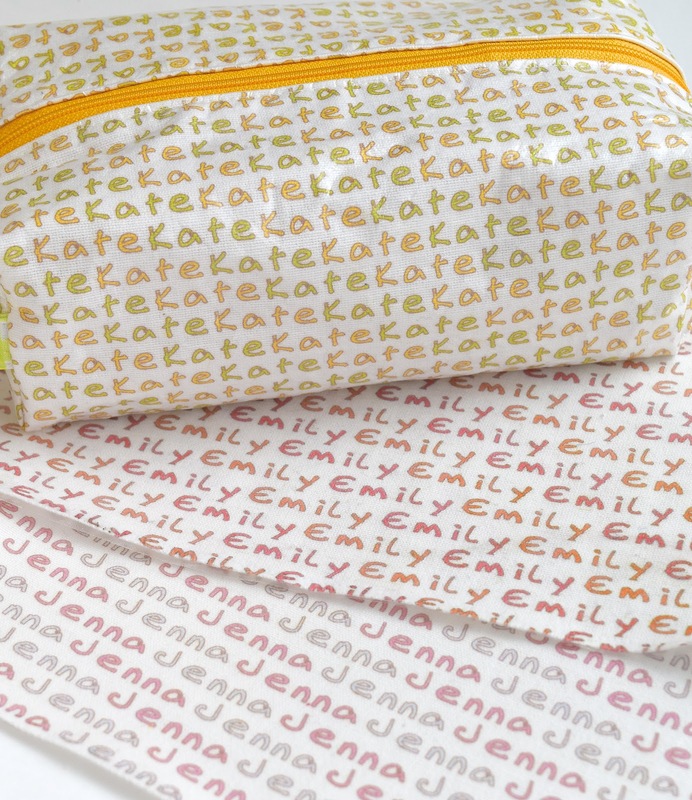 Do you think you could create 3 with *my daughter's name* on them and send them to me for free by next Tuesday? hahaha Just kidding. Love your latest post about requests. I see them as great compliments to your ingenuity and vision. How could we mare mortals replicate your awesome designs! Have a blast in Singapore!